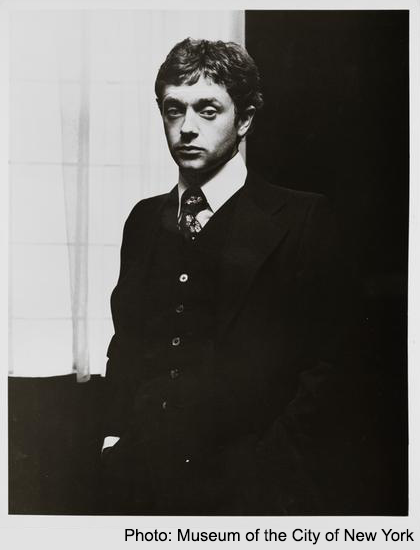 Michael Kitchen played the character of Foster in another Harold Pinter work, No Man’s Land. The stage production premiered in London in 1975 before Michael Kitchen replaced Michael Feast in limited engagements in Toronto (Sep. 13, 1976 – Oct. 9, 1976), Washington D.C. (Oct. 11 – Nov. 6, 1976), and on Broadway (Nov. 8 – Dec. 18, 1976). The cast then returned to London for a final five-week run in early 1977. Fortunately, prior to the show closing it was filmed for posterity and later broadcast by the BBC in 1978. This clip from almost the end of the play is the best part, in my lowbrow opinion. The play was pretty inscrutable to me. But that may be because I skipped over all the scenes of drunken rambling, i.e. most of the play as far as I could tell. …the new boy, Michael Kitchen, is an inventive and potentially powerful comic actor, with great suppleness of emotional color. 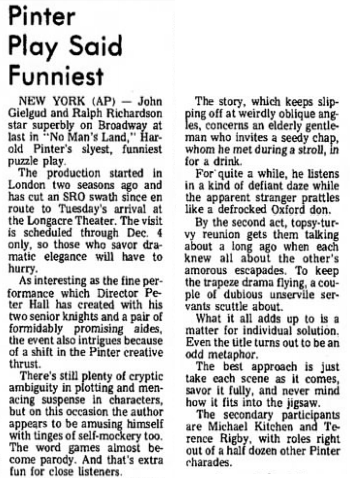 This entry was posted on Monday, April 22nd, 2013 at 6:20 am	and tagged with Harold Pinter, John Gielgud, Michael Kitchen, No Man's Land, Ralph Richardson, review, Terence Rigby, video and posted in Theater, TV. You can follow any responses to this entry through the RSS 2.0 feed.